Over the past year, possibly longer, the word ‘esports’ has likely worked its way into your inventory. Maybe you have heard mention of it in the news, or you read about the NBA starting their own pro esports league. However you heard, you may wonder - what’s so appealing about watching other kids play video games? When you break down esports’ path to success has gone through very similar stages to that of the traditional professional sports we watch today. Leagues like the NHL, NBA or MLS all had their own battles as they established themselves, and when compared to esports many similarities can be drawn. Esport viewership demographics indicate that more than 70% of their 650 million fans are between 18 and 30 years old. Many youth around the globe are spending their spare time playing, streaming, and watching esports. This demographic is immensely sought after by big brands as they are often hard to reach. Therefore, it is no surprise that nearly 40% of esports revenue comes from sponsorship. The millennial demographic has been a challenging group for brands to engage with as their habits for consuming content have changed in the digital age. As the age of traditional sports viewers changes and streaming services gain the media rights to the sports industry, brands have to think creatively about how to get in front of their target audiences. Traditional sports leagues, like Major League Soccer(MLS), show proof of this. In recent seasons the MLS has received more and more attention. Majority teams sell out games and have passionate fan bases. In Canada alone, there are over 834, 363 registered soccer players, refs, and coaches, at all levels of the sport. So it is no surprise that the Vancouver Whitecaps and Toronto FC have captivated audiences game after game. If the proof is in the participation, esports is doing well. In 2017 over 650 Million people participate in esports at various levels. An entire generation (Gen Z/Centennials) have grown up in a world with the internet, Xbox, PlayStation, and gaming. This population base is responsible for taking esports to the next level, which started out by holding esports competitions. Over time these competitions have evolved into the formation of teams that pay in international tournaments for prize money, thereby classifying themselves as pro esports players. Where there are pro players there are fans. As it is still a realm that is so new to many people, esports has struggled to gain traction and be taken seriously in the traditional sporting realm, but the engagement from the fanbase can no longer be ignored. Whether through participation at a recreational, competitive or pro level, esports communities closely resemble that of traditional sports. This engagement is growing steadily as new gamers begin streaming on Twitch every day. As the esports industry grows and evolves, the similarities to traditional sports become more and more pronounced. Soccer is considered by many the most popular sport in the world. It is played in nearly all countries around the world. While its growth to popularity was decades ago, it continues to garner new fans each day. Pro leagues exist on most continents, and nearly all major cities have their own pro soccer team. While the sport was created decades before video games were ever conceptualized, soccer took root because it was easy for everyone to play and access. All you needed was a ball and a pair of shoes. While esports growth is still in its early stages and may take a different shape it has similar attractions - mainly, ease and access. Ease. Each game, while different, starts out at Level 1. As the player progresses through the levels the game gets harder. So anyone can take up an esport and develop their skills as they progress. Access. While there are a few more barriers to access esports, they become less restrictive as globalization continues. All you need is a computer or phone and an internet connection to start. 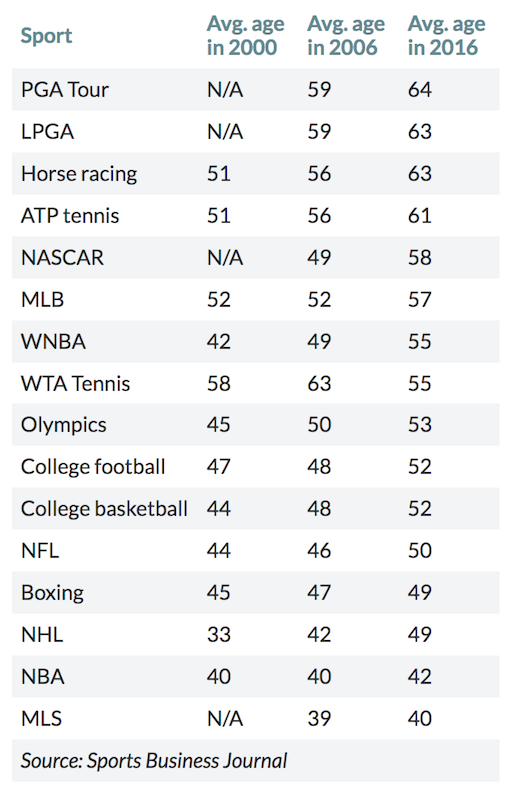 The change in the average age of audiences watching sports in the USA over the last 20 years. From the Sports Business Journal. Esports has been around as early as 1972, however, has grown exponentially since the early 2000s. As esports explode across the planet, the industry has begun to evolve and legitimize itself within the sports and entertainment industry. In 6 years the League of Legends (currently the most popular esport) went from $100,000 US in prize money at the 2011 World Championships, to $5 Million at the 2017 Worlds. In 2017, over 50% of that prize money was raised by fans. It is this type of growth that has the movers and shakers of the world turning their heads. Brands have been forced to look for new and innovative ways to engage with their consumers. For many they are looking at how to engage with consumers 18–30 year old millennial & centennials. These digital age consumers are harder to disrupt with traditional advertising material. Of the 650 million esports base, 70% are in this age group. There is no denying the power these statistics have over marketing budgets. Especially as the average age of traditional tv viewership is on the rise. In the USA, the average age of TV viewers is rising faster than that of the US population in all leagues except the WTA, NBA, and MLS. If the average age of sports viewers is twenty years above the target that brands are looking to engage with, it is no wonder that these sponsors and their funds are moving to a medium with a higher concentration of the demographic they seek. Esports companies like FanAI are helping brands identify how best to enter the market. Already, companies like Intel, Coca-Cola, Comcast, Audi and Red Bull are among the top sponsors in esports. In recent years esports have seen an influx in participation, money and popularity. As a result of this influx, the esports structure has begun to resemble that of traditional sports leagues. With games like League of Legends which have had global tournaments since 2011, other games have started organizing leagues across the globe. 2018 has seen the inaugural season of two esports leagues that look more like traditional sports than any other before. The Overwatch League began in January with twelve city-based teams, competing in seasons based on the traditional format of leagues like the NBA and NHL. The second league that formed was the NBA2K League, with esports teams affiliated with 17 NBA teams. Starting with a tip-off tournament on May 1, 2018, the league also follows a similar format to a traditional sports league. The formation of leagues like these indicates the validity that esports have in the world. In upcoming years esports will begin to look more and more like traditional sports as they grow, and build infrastructure. This is the first in a 4-part series to introduce Sports audiences to the world of esports. Subscribe to stay tuned for Part 2!